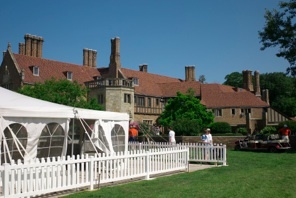 In the midwest, the concours of the year is Meadowbrook in Detroit, a well established concours, with many cars from the 1930’s,a more relaxed event than Pebble Beach. As cars are to be used, the B20 was driven up the 300 miles to the Concours, with only a small detour to weld up an exhaust break. Highlight of the trip was 100 miles on a lovely two lane country road through Michigan farms. 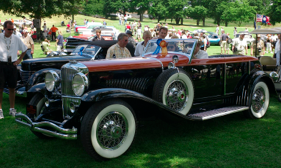 The concours was filled with many 1930’s cars – Packards, Duesenbergs, Bentleys. 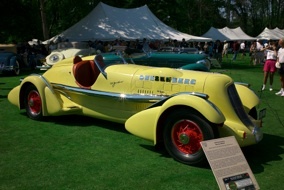 European cars are less prominent here, but there were two classes of Ferrraris, and two European classes. The B20 was with Sports Cars to 1955 with a Bugatti 35, Jaguar 120 alloy, a 1921 Vauxhall from 1921 (same owner for 50 years, it was his first car! 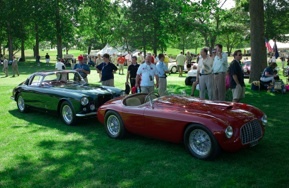 ), a 1951 Porsche, and a Jag SS 100. Not much chance for the B20 altho the judges liked it. Not too sure anyone else drove their cars – the Porsche had less than 2 miles on it from the year before. 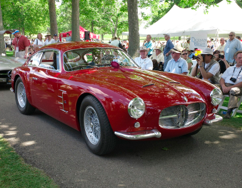 The other class of European sports cars after 1956 included a lovely Bizzarini and Bruce Male’s freshly restored Maserati Zagato. The ride home at night was a delight – again, that country road, with the soft glow of the B20 instruments and cool summer night air – wonderful. Cruised home between 70-80 most all the way, intoxicating to be sure. A drive to be remembered. 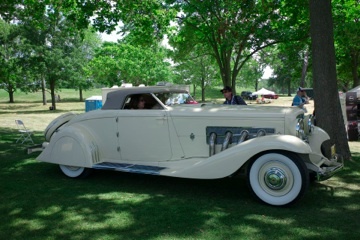 Sam and Emily Mann’s Duesenberg with custom body for Clark Gable and Carole Lombard. Imposing to be sure. Above – the Marmon Meteor and another Duesenbergs, Dodge estate. 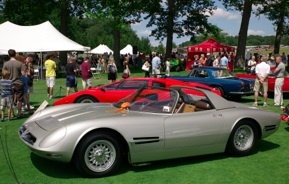 Below – two Ferraris, and Bizzarini, with Maserati Zagato.